Them yellow tristar synchros are as rare as hen's teeth !!! I must pop down and have a look see what I can find in my barn one of these days - maybe tomorrow..
Maybe in the Brochure but did we they ever make any? I admit to forgetting about the black ones. Google images shows there maybe some Blue ones, well, as always open to being proved wrong! only the M codes will confirm! Odd he still cant spell after it being pointed out to him .... and he such a seasoned VW van owner .... I'd love to see the Syncro sticker on his 88 GL !! Pardon my french, but what the "feck" are you people doing? Some of you are so rude, intolerant and unkind it makes me want to slap your buttcheecks with a worn out timing belt. Grow up and try to behave. No, I am not angry. I am disappointed. the rhd tristar that i have seen is blue a dark blue. originally bought buy some kind of forestry worker/company. has a vindic on it and peperpot wheels. was looking a bit sorry for its self but undergoing work. so hopefully will be saved. so long as it stay away from the sea air. Spose the best thing to do is ring either graham or kamper wotsit a and ask a lot of questions..
Sensible question. Could you still get Bamboo yellow after '85/86? Even allowing for a customer special order, which would be far more likely in LHD form, because syncros were so flippin' expensive over here for starters. EDIT : Yes you could! H1B available right up to the end, according to Bricky. At the risk of heading of track, anyone see the tristar/not a tristar that has all the features of a tristar but none of the M codes, that the yanks were getting moist over as a well known dealer said it was a tristar. I know for a fact that Shaun (of the kilt that's not a kilt but a skirt with pockets) turned a rhd Tristar into a leftie because it was 2k and no-one else was bidding. Besides which, this all started off as a sales pitch with no price. We've all had a bit of fun and the sap is clearly rising, but may I be so bold as to suggest that the mods reach for the barn door latch now that the donkey has done a runner? Well, you learn something new.. Seems there was indeed a myriad of colours, maybe yellow is a possibility? 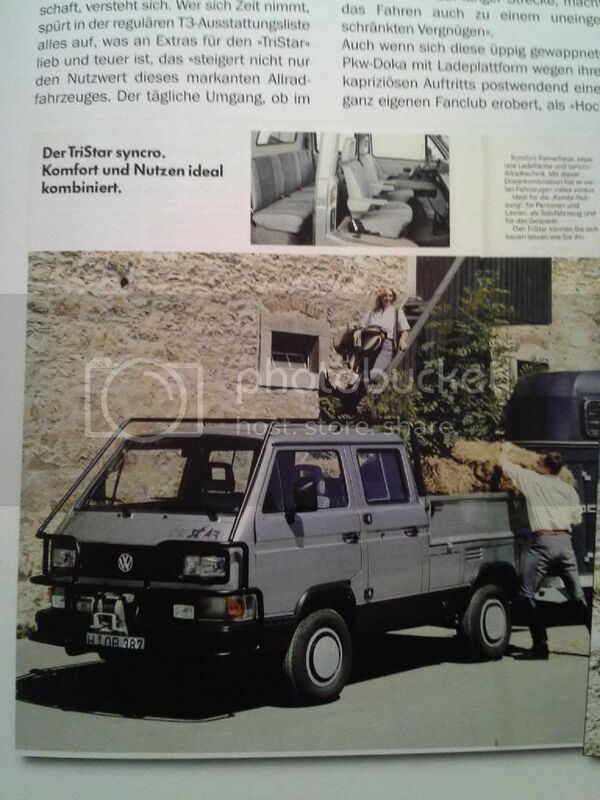 Model number for RHD TriStar syncro. 248AA5 - DJ engine, 2.1l petrol. 248A95 - JX engine, 1.6l TD.